Casino Brango is a new gaming venue catering to players from all the corners of the Earth including the US. Established in spring 2017, the casino runs on the NuWorks Gaming software platform. Being one of the lesser known casino games provides, NuWorks is a sister platform of Realtime Gaming and the overall appearance of the casino and the atmosphere at it may strike you as familiar. From the casino lobby to the games available, everything will seem new and unknown and, at the same time, as a some kind of déjà vu. The gaming venue is a sister site to Casino Extreme, which is great. Casino Extreme is one of the most reliable and fastest payout casinos online, so you can enjoy a new and exiting casino, but in a safe and trustworthy environment. Players can join Casino Brango and download free software or play in the instant-play mode directly on the site. However, punters who prefer playing casino games on the go will not be able to access the gaming venue as it is still not available for mobile play. Once you have made your first deposit, you can claim up to $2,000 in welcome bonuses. Over your first 5 deposits, a 100% match bonus up to $400 will be credited to you. Before you make a payment, provide the coupon code BRANGO at the Cashier’s. You can cash as much as 30x the amount of the qualifying deposit and the wagering requirements are set at 15x the deposit and bonus amount. To meet the wagering requirements you need to make wagers on non-progressive slot games, Video Poker or Keno. Players who make their first payment via Bitcoin can take advantage of a 200% bonus on their first deposit. To make use of this offer players need a Bitcoin wallet. All players who deposit between $20 and $200 can redeem this bonus if they enter the coupon code BTC200. The same amount is given to customers who create a UPayCard account, make their first deposit via this banking option and provide the code UPAY200. Players are also offered a No Strings Attached Cashback, a 15% bonus given to players who have made a deposit without claiming a bonus and lost it all. No wagering requirements are to be met and there is no maximum cashout limit. There is also a 20% Easy Go Bonus with absolutely no limits if you deposit $100 or more. Players can collect comp points whenever make a real money bet and advance up the VIP levels to get more bonuses, gifts and other incentives. NuWorks Gaming is still relatively unknown company which has developed one of the latest software platforms available on the already saturated online casino market. At the moment, the software developer offers 30 original video slot machines along with 4 Progressive Slots which feature the random 5-level, interactive progressive jackpot game Jackpot Pyramid. Besides slot machines, the NuWorks’ portfolio includes Blackjack. Let’em Ride, Baccarat, Tri Card Poker and Video Poker. All the games are operated by the random number generator that grants unbiased results. The RNG has been audited and tested for fairness by the independent auditor Gaming Laboratories International (GLI). The casino software can be easily downloaded and installed on all computers which are powered by Windows. 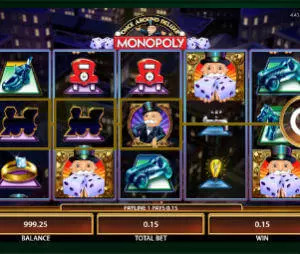 However, MAC user will have to settle for the instant-play version of the casino which offers not as wide game selection as the download platform. While the download casino offers more than 60 exciting games including slots, Blackjack, European Roulette, Tri-Card Poker, Baccarat, and Jacks or Better, a Video Poker variant, at the instant-play version of the casino players can try their luck on 15 slot machines, 3 Video Poker Variants and European Roulette. When it comes to banking, the supported banking methods include credit and debit Visa and MasterCard, Bitcoin, UPayCard and Skrill. Casino Brango accepts only payments in USD or EUR and the minimum deposit one can make is $20. 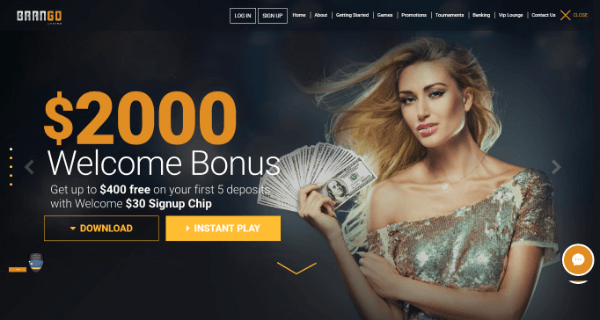 Withdrawing winnings can be done via Bitcoin, UPayCard and Skrill and the funds will be instantly transferred from the casino to banking accounts. Together with Casino Extreme, this is pretty much the only USA friendly online casino with instant withdrawals. Players can rest assured that all their transactions will be safely carried out as Brango Casino uses the most advanced security measures which keep all your personal and financial data protected. Owned by Anden Online N.V, a company which runs Casino Extreme since 2000, Casino Brango is a completely new gaming experience thanks to the software it uses and the collection of the games available at it. Offering a range of generous bonuses and promotions along with the VIP scheme, the casino accepts players from a long list of countries, including those where online gambling has not been regulated yet. The good news is that the casino supports transactions via Bitcoin, which may be perfect for the residents of the countries where the governments try to curb online gambling, like the US. If any problem occurs, customers can reach the support team via 24/7 live chat, email or toll-free in US and Canada phone or fax. The weakest point of the casino at the moment is the limited gaming content, as it makes the gaming venue seem as if still under construction.